The Ultimate Jackpot Tug Toy is exactly that... the ultimate in food motivational and tugs all combined into the one toy. This toy is great for your food dog or tug dog. And an excellent tool to teach your food dog to tug, or your tug dog to like food. 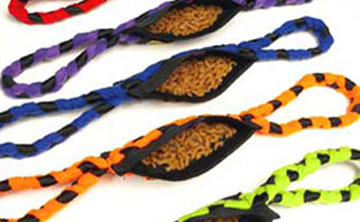 The tug toy section is made with strong braided fleece and has two handles on either side of the food pouch. The food pouch itself is made with very strong nylon webbing. The pouch on this treat toy has a Velcro closure and a small pull tab for easy opening. The Ultimate Jackpot combination treat toy is approx 70cm long, including handles, and the food pouch is 18cm x 7.5cm. Available in assorted colours - please let us choose. Note the latest Ultimate Jackpot Toy has a fluro red pouch for even more fun! This tug toy is machine washable and resistant to rips and tears. Specialising in agility dog toys, training and trialling equipment. Located in Melbourne Victoria Australia.